Two weeks ago, we mentioned that idea of "reputational risk" insurance being floated in the wake of the Tiger Woods scandal. But how to measure the damage? This is not like, say, a fire, where an insurer can simply tally up structural damage and replacement cost of contents. Well, yesterday two professors from the University of California, Davis attempted to put a price tag on the damage, and the number's pretty astounding. Professors Christopher Knittel and Victor Stango estimate that shareholders in the companies that Woods endorsed lost a total of $5 billion to $12 billion in value in the time between his much-publicized SUV crash and his announcement that he was leaving golf indefinitely. And those calculations don't include losses to Wood's current- or future endorsement income. Interestingly, the researchers concluded that Woods' sports-related endorsees suffered substantially more economic damage than non-sports companies, like business consultant Accenture. In local news, the Seattle Times writes about the potential flood risk of decades-old, poorly-maintained levees in the Green River Valley. Time details some of the high-visibility things that would kick in immediately under health reform, versus the 2013 start date for much of the legislation. The Seattle Times covers Congress' moves to close Medicare's infamous "doughnut hole." A good year: Reinsurer Munich Re AG says that catastrophe costs were down in '09. The AP reports on a provision in health-reform legislation that would "nudge" people into getting long-term care insurance, at a projected cost of $160-$240 per month deducted from their paychecks. Rate reviews by the Washington state insurance commissioner’s office have shaved more than $300 million from Washingtonians’ auto and homeowners insurance bills over the past decade. In order to change rates, some insurers in Washington must get approval from the state insurance commissioner’s office. The companies produce data and calculations showing their justification for the requested rate. The state’s actuaries then review the request. Each request is viewed on a case-by-case basis. Some are approved as requested. But many of the approved rates end up lower than what the companies originally requested. The changes can save policyholders millions of dollars a year. For example, from 2000 through Nov. 30, 2009, rate reviews by the Office of the Insurance Commissioner trimmed more than $55 million from proposed homeowners’ insurance rates. Some insurance companies are offering "accident forgiveness" as an option or to keep a valued customer. Accidents can mean expensive repair and liability costs, and lead to higher premiums. Accident forgiveness means that an insurer agrees not to increase a customer ’s premium after the driver is involved in an at-fault accident. It is an enticing perk that many insurance companies offer either as part of a standard policy to loyal customers or as an additional endorsement that drivers with a safe driving record can purchase. Some companies also use it as an incentive to new customers for switching from another insurer. Insurers will often even extend the option to parents of teenage drivers. 1. Is there a cost involved? In some cases, accident forgiveness is included as part of a standard car insurance policy; however, you will typically pay a higher premium for a policy that includes this added protection. More often, accident forgiveness is offered as an additional endorsement – or coverage option – for a fee. Costs vary by insurer, so check with your current insurer as well as a few others if you’re looking for the best deal. • Customer loyalty: Many insurers only offer accident forgiveness to customers who have been insured with the company for a certain number of years. • Driving record: To qualify for the benefit, many insurers require that drivers have a clean driving record for several years. Not only will insurers look at your accident history, but some consider driving violations as well. That means that one speeding ticket could impact your eligibility. 3. Are all accident forgiveness policies created equal? In a word, no. Policy conditions can vary greatly. Some policies require you to maintain a clean driving record for up to five years before you become eligible for accident forgiveness. With other policies, the coverage kicks in immediately. Similarly, some policies offer forgiveness for one accident while others forgive multiple accidents. 4. Does accident forgiveness make sense for you? After an accident, insurers can raise your premiums by as much as 40 percent. If you are a safe driver who pays standard rates, then depending on the cost, accident forgiveness might not make sense for you. But if you have a history of violations and accidents and already pay higher rates, then opting for the benefit might help you save money in the long run. Talk with your insurance company or agent to learn more about how your rates might be affected by an accident. Little-known fact, Part II: In order to raise rates, many insurers in Washington state must get approval from the state insurance commissioner's office. The agency's staffers look at the requested rate and the calculations behind it. In the end, the rate our office approves is often lower than what the companies originally requested. The reduction is usually a small percentage -- over the last 10 years, the reductions in personal auto insurance requests have ranged from 1/10 of a percent to 2.8 percent -- but the amount shaved from premiums is considerable. From 2000 through Oct. 31, 2009, these rate reviews and reductions shaved nearly $243 million from proposed car-insurance rates. In the first 10 months of this year, for example, such rate reviews trimmed $26.1 million from proposed rates, a reduction of about 1 percent. In 2008, it was $44.4 million, or 1.7 percent. With hundreds of flights canceled on the East Coast due to a major storm and a lot of people stranded while trying to travel for the holidays, it's probably a good time to highlight our travel-insurance primer. And if you're a Washington resident and have questions or problems with a travel-insurance issue, call our consumer hotline at 1-800-562-6900. We don't sell insurance. We're the Washington state agency that regulates it. But first, thanks to those of you who are reading. Like most websites, we can tell how many people are reading, how they're getting to this blog, what keywords they search for, etc. And one thing that's become very clear is that people are reading this blog at work. Our numbers drop to near-nothing on weekends, then spike back up early Monday morning. (Apparently, insurance isn't big on people's minds when they sleep in on a Saturday morning.) The only significant exception to this seems to be storm-related posts, such as homeowners searching for information after a recent wind storm. Insurance Journal and The (Vancouver) Columbian both wrote about a Washington state insurance fraud case. Lots of news about health-care reform in the runup to an expected Senate vote on Christmas Eve. The Wall Street Journal has an overview entitled "Historic Health Vote Looms," and the LA Times has a nuts-and-bolts comparison of the House and Senate bills, side by side. Writing in the Washington Post, Robert Samuelson says the bill's passage "could be a nightmare for Obama," while the New York Times' Ross Douthat looks at the GOP's efforts to derail the bill. The New York Times also found some interesting carve-outs in the bills. Lastly, the Wall Street Journal reports that State Farm is dropping it's plan to leave the property-insurance market in Florida. Instead, the company reached a deal with Florida's insurance regulator that allows the company to not renew 125,000 of its 810,000 Florida policies, and to boost rates on the remaining ones nearly 15 percent. Minimize the chance your pipes will freeze by insulating pipes in unheated areas and those that run along outside walls, floors and ceilings. Disconnect outside garden hoses, and seal foundation cracks that let arctic air freeze pipes in crawlspaces. • Open cabinet doors to allow heat to get to piping under sinks and vanities near exterior walls. • Run a small trickle of water from hot and cold faucets during extreme cold. • Keep exterior doors to unheated spaces closed as much as possible during winter months. • If you plan to be away for an extended period have the water system professionally drained. • If you are taking a short trip, ask a neighbor to check the house regularly during severe cold spells. Discovering a burst pipe or water leak quickly can prevent excessive damage. • Install a whole house water leak detection system. • If you own a business that will be unoccupied for more than 24 hours at a time make arrangements to have the building inspected once a day during winter. Quickly discovering a burst pipe or water leak can prevent excessive damage. This year it's not the snow, but freezing temperatures reeking havoc on Washington homeowners. State Farm, the state's largest homeowner insurer, has declared their own state of emergency. What does this mean? To get ready for the onslaught of calls and claims, they've hired additional adjusters. So far, they've had 215 freeze-related claims and expect that tally to reach 500. Some advice for consumers: First, turn off your water source. If your pipes have broken, take steps to mitigate any further damage before you call your insurance company. Learn more. Remember, we're here to help. If you're having trouble with a claim or have questions, call our Insurance Consumer Hotline at 1-800-562-6900. The proposed elimination of Washington state’s Basic Health Program would accelerate an already bleak trend in Washington state. It would mean tens of thousands fewer people with health coverage. It would also drive the number of uninsured people in Washington above a million next year. “I fully recognize the grim budget situation that Gov. Chris Gregoire and state lawmakers face,” Insurance Commissioner Mike Kreidler said Wednesday, after the governor proposed eliminating BHP as a cost-cutting measure for the 2010-11 supplemental state budget. The cuts would also mean that Washington’s uncompensated medical care – bad debts and charity care – will rise to a record $1 billion by late 2010, instead of the projected 2011. 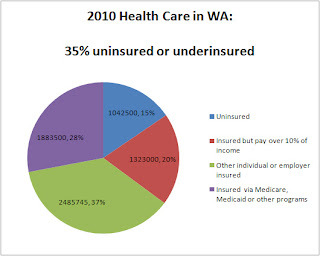 Including the proposed BHP cut, the percentage of Washingtonians with no health coverage is expected to rise to 15 percent next year. Another 20 percent of the state’s residents will be “underinsured,” meaning that they have health coverage, but that they spend more than 10 percent of their income to pay for it. All told, more than 1 in 3 of the state’s residents will be uninsured or underinsured next year. How do they get insurance at Gatorland? How does one underwrite, um, alligator wrestling? Someone does, apparently. Insurance Journal, a trade journal, has put together a video about risk management and insurance at...Florida's "Gatorland" theme park. Why is a dead chihuahua worth $30k? Courts usually don't agree because the law doesn't allow them to. In fact, a pet owner typically can't recover much more than out-of-pocket expenses when an animal is injured or killed due to some one's negligence. Current practice is to value pets at what they would cost to replace, the way insurers put a price on used cars. In 2002, an Oregon jury awarded $136,000 to a family that lost four dogs to a neighbor they alleged had poisoned them because he was fed up with their barking. In a civil suit that went to arbitration in Washington state in 2008, three men were ordered to pay $30,000 after killing a Chihuahua named Tia. The men had been drinking, and one was asleep in a car when Tia, barking in her backyard, apparently awakened him. He shot her dead. In 2007, Chicago settled with resident Calvin Hale after a police officer who ran through his property in pursuit of a suspect shot and killed his 10-year-old Akita, which Hale had raised since puppyhood. He received $27,500. So what do these trends mean? Possibly higher homeowners insurance, veterinary bills and even leashes and pet food. How can I get information to rate auto insurance companies? I want to change companies and I think looking at the premiums only is not a thorough way to research where I want to change my auto insurance. Is there a page that shows percent of complaints or any other information that would be useful. Many thanks. I emailed her back, steering her to our online "complaint comparison tool" that allows consumers to easily compare complaint ratios for auto (or other kinds of) insurance. One caveat: the numbers can be skewed for companies with only a very small number of policies, which is why we also list the market share of each. Passing health reform in its current form, the letter warned, would boost health care premiums “by over $7,000” for families buying new or different coverage. After a meeting between Office of the Insurance Commissioner’s staff and Premera officials to discuss the basis for the analysis, Insurance Commissioner Mike Kreidler this week sent a letter to the state’s congressional delegation. Premera’s numbers are misleading, Kreidler said. In particular, the analysis gave no consideration to reforms aimed at reducing the cost of premiums. Nor did it take into effect the availability of new premium subsidies that would make health insurance affordable for many of those who can’t currently pay premiums for themselves or their families. “…the Premera communication appears to be more of a political document than an actual analysis of the effects of any specific proposal before Congress…It ignores any of the expected benefits to passage of health care reform legislation. Washington state Insurance Commissioner Mike Kreidler said Thursday that a recent check showed that fewer than 1 in 4 of the buildings in the Green River flood plain have federal flood insurance. He's strongly urging more owners -- as well as renters -- in the area to buy flood coverage as soon as possible. Recent work on the Howard Hanson Dam has lowered the risk of catastrophic flooding in the valley. That's the good news," said Kreidler. "But the risk of flooding is still significantly higher than normal." It's important to act quickly, he said. The insurance, sold by local agents and brokers as part of the National Flood Insurance Program, generally doesn't take effect until 30 days after a policy is written. Also, FEMA is revising some of its flood maps in the area. In the Green River Valley, the new maps will likely broaden the areas considered high-risk zones. The new maps take effect in September 2010. But under NFIP's "grandfather rule," people in areas considered moderate- to low-risk zones can buy coverage now and lock in the lower rates, which will apply even after the new maps take effect. The average flood insurance policy from NFIP costs $540 per year. According to the NFIP, as of Sept. 30, 21.4 percent of the structures in the Green River flood plain were insured through the federal program, which is the primary source of flood coverage for most homeowners and many businesses. Some 474 of the area's commercial structures and 2,542 homes are covered. Statewide, only 16.5 percent of at-risk structures have federal flood coverage. One little-known aspect of the federal program is that it also offers coverage to renters. Residential premiums start as low as $39 a year for contents-only coverage. "Renters shouldn't assume that their apartment owner's insurance will cover their losses, because it generally doesn't," said Kreidler. "A flooded apartment can easily lead to thousands of dollars in damages. Renters have to protect themselves, too. Congress established the National Flood Insurance Program in 1968 to provide an insurance alternative to federal disaster assistance after major floods. The Federal Emergency Management Agency administers the NFIP, although the policies are sold and adjusted by thousands of private-sector insurance agents, brokers and adjusters. The policies cover up to $250,000 for residential structures and $100,000 for contents. Businesses can buy up to $500,000 in coverage for a building and $500,000 for contents. And renters can buy up to $100,000 in coverage for their belongings. Property owners needing more coverage than that, such as businesses, generally have to purchase “excess” coverage through a surplus lines insurance broker. These policies can be very hard to find now – and very expensive -- in the Green River Valley. And such policies often require the buyer to first have federal flood coverage. Kreidler’s office is urging private insurers to keep selling policies in the area, and is seeking legislation that would allow his office to intervene when an insurance market dries up. Washington state's new domestic partnership law goes into effect today, creating new insurance rights for nearly 13,000 people in our state. For most insurance coverage, it's pretty straightforward; wherever your policy says "spouse" it must also cover state-registered domestic partners. But if you're partner hasn't been named on your policy you'll need to contact your insurance company directly to make sure they're covered. Here's a list of commonly asked questions about the new law and insurance. Health insurance is less cut and dry. If your employer self insures -- meaning they don't have a private insurance plan -- state laws don't apply. If you're not sure what type of health plan you have, we can help. Call us at 1-800-562-6900 and we'll help you sort it out. Now for a related topic: Your odds of getting run over. Transportation for America, a group that advocates for safer streets, has just put out a report ranking cities on how dangerous they are for car/pedestrian accidents. The most striking thing about the data is that the top four most-dangerous cities are all in Florida: Orlando, Tampa, Miami and Jacksonville, in that order. In fact, the most dangerous metropolitan areas tend to be in the South: Memphis, Raleigh, Louisville, Houston, Birmingham and Atlanta. And if you're thinking that it's because more people walk there, the report says, that's not necessarily the case. Orlando, for example, has "a very low proportion of residents walking to work" -- 1.3 percent -- but a very high pedestrian fatality rate. In other words, the few people who do walk in Orlando face a relatively high risk of being killed by a vehicle. The real problem, the report says, is often poorly designed roads that force pedestrians to walk along -- or cross -- arterials. Here in Washington state, the most dangerous metro area is Yakima, although its "pedestrian danger index" of about 81 is relatively low compared to the cities listed above. Next-worst are the Tri-Cities, Bellingham and Vancouver. Spokane and Olympia rank relatively well, and Lewiston has a perfect record: No pedestrian fatalities in 2007 or 2008. In West Virginia, however, you might want to install what the Australians call 'Roo Bars. The odds of hitting a deer there in any given year, State Farm says, are an astounding 1 in 45. And here in Washington state? 1 in 516. Here to help is Washington's Department of Transportation, which put up a very good blog post detailing why the deer tend to come out of the woods at this time of year and what do do when speeding toward them. The short form: watch for brake lights or slow-moving cars ahead, know that where you see one deer there are often more close by, and, if a collision is imminent, try to drive straight and not swerve. And if you really love stats, here, also courtesy of WSDOT's blog, is the mother lode of deer/car data in Washington. • Prohibit insurance companies from using some factors to set rates, such as drivers’ level of education, their occupations and personal credit ratings. • Prohibit auto insurance rate increases for those with good driving records who are not at fault in accidents. • Allow the state insurance commissioner to deny rate hikes by insurance companies before the rates take effect, and order refunds for consumers who are charged too much. NJ: City of Passaic is considering billing insurers for firefighting costs: $500 for a home and $25k for a business.